During a recent trip to NYC, I was fortunate enough to visit the Yarok Beauty Kitchen and meet Yarok's fabulous founder, Mordechai Alvow. 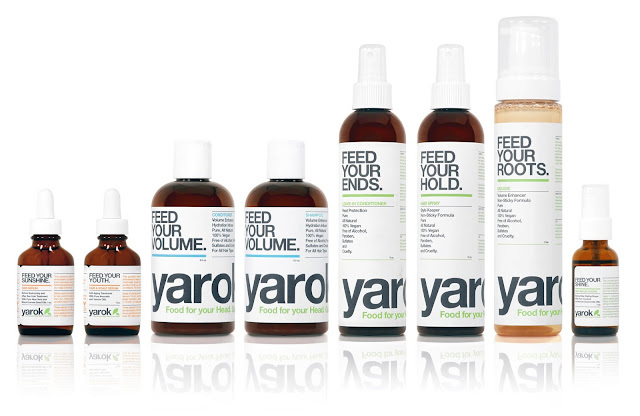 In addition to creating one of the world's best organic haircare brands (available at yarokhair.com and abeautifulworld.co.uk), the sought-after hair stylist has worked with numerous designers, photographers and celebrities. His work has graced the pages of Allure, ELLE, InStyle, Marie Claire and VOGUE (to name but a few), and his celebrity clients include the likes of Melania Trump, Naomi Watts and Vanessa Lachey. Mordechai founded Yarok out of a desire to create organic haircare products that perform as well as their synthetic ingredient-packed counterparts. He succeeded in his mission and, today, Yarok offers a variety of haircare products that are not only organic and safe to apply, but provide amazing results and smell amazing. What inspired you to work in the hairdressing industry? And how did your career journey begin? To give you a bit of background on how I grew up… I was born in Israel in a city called Jaffa. Jaffa was also known as the city of oranges and everyday I woke up across from an orange grove. It fragranced the air and I always felt lucky that it was my scenery. Both of my parents loved cooking and talked constantly about ingredients. My dad used olive oil for everything and my first knowledge of new and rare and raw ingredients came from an older cousin. My first encounter of healing remedies was with my grandma, who used to use herbs from her little garden. As a child I loved visiting apothecaries with my mom, they were my candy store! Scents of nature filled the space and I was in awe of the colors and shapes of the bottles. I think that is where I developed a 'nose'. Fast forward to my early 20s, I chose hairstyling as my career and moved to New York. This career was always more about the effect I could have on people’s lives and how I could make them fall in-love with themselves after looking in the mirror. Don’t get me wrong though, the glamour was pretty great too! When I was pursuing editorial work, I got introduced to Mariah Carey and worked with her for one year; it was an amazing experience! I styled hair for Naomi Watts, Catherine Zeta-Jones, Marisa Tomei, Venus and Serena Williams, Channing Tatum, Kelly Rowland and more. Styling hair for Alexander McQueen in Paris has to be the most the most memorable. I did it for a year and it was beyond magical. Find something unique about your work and/or personalty and develop that to the max! Be true to yourself and don’t have an EGO. When I was about thirteen I had a poster of Farrah Fawcett on top of my bed - her hair was amazing. I love all timeless beauty icons like Natalie Wood, Faye Dunaway and Audrey Hepburn. For me, the present day beauty icon is Charlize Theron, she is a truly beautiful woman. What are your hair and beauty essentials? I like to wake up in the morning and understand that it's a new day. So I like to evaluate what I'm feeling that day and which Yarok products would work best for me, considering the weather and the look I'm going for. I do like to mix different textures and different moisture levels and I like to apply them in layers, adding small amounts at a time until I am happy with the results. I enjoy nut oils and essential oils for both my face, body and hair. I also like other natural brands such as Weleda, One Love Organics and Kahina. What is the biggest hair crime a person can commit? Having a keratin treatment as it is so bad for your hair and health. It takes about five or more years out of your hair life. Everything changes around us constantly, so one should change their hair as well… hair is a great accessory and it is so changeable.